You’ve promised your body that you will adopt a healthier lifestyle — something just shy of a “diet” because you know yourself too well. If what you’ve taken on is reduced to that, it’s probably not going to last because you don’t believe in diets — and for good reason. You’ve seen too many people begin with all the motivation they can muster, then when they realize the pounds aren’t falling off as quickly as they’d like, or that after what is considered a good effort, they’ve plateaued, motivation dwindles and the “diet” is quietly ignored. I can’t risk that because my knees will never forgive me for having to carry around 50 pounds they hadn’t counted on at their age. Last September when I began to think about more obsessively about my weight and lack of routine exercise (no coincidence since I’d just turned 55) I began to find reasons to avoid the kitchen. Meals became food I could easily pick up and eat with little or no thought. I stopped looking at new recipes and rarely used one to try something new for dinner. And baking? I stopped that almost completely because it seemed pointless to bake something, taste it, then try to find a home for it outside of mine. I’ve never been a big sweets eater, but I thoroughly enjoy spending a morning in the kitchen baking something — especially if it involves a little thought or teaches me something new. 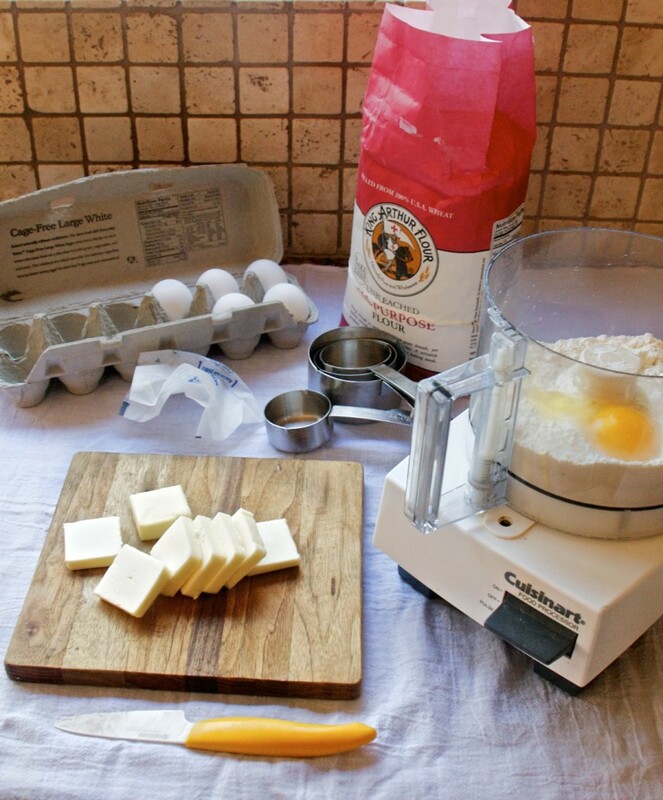 I miss that and know baking needs to be a part of my life — as does dessert. Dessert is a food group, isn’t it? I’m kidding, of course, but the point is I want to bake and enjoy dessert occasionally so have to find a balance with desserts that showcase a simple fruit without a lot of added sugar or an excessive amount of fat, for example. Something classic, satisfying. Elegant, but not fussy. 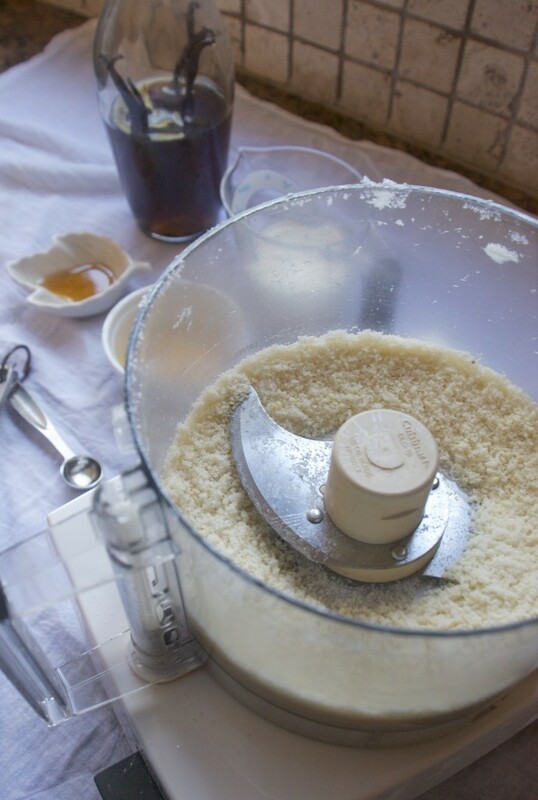 Attach the metal blade and put all ingredients into the bowl of a food processor. Pulse ingredients just until a ball begins to form on the blade. 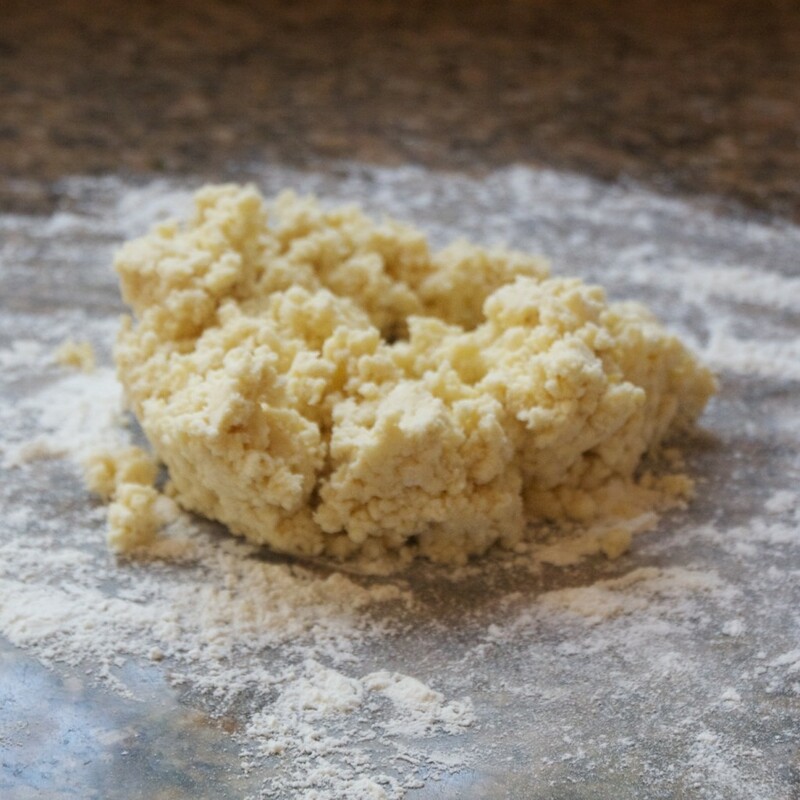 Turn dough out onto a lightly floured surface and begin to lightly knead, using a pulling away action with the heel of one hand lightly pulling the dough away from the other. Continue a few times until the dough is smooth. Dust the dough with flour and make a flattened disk, cover well and chill while you make the filling. Preheat the oven to 500 degrees F and position the rack to the lowest position. 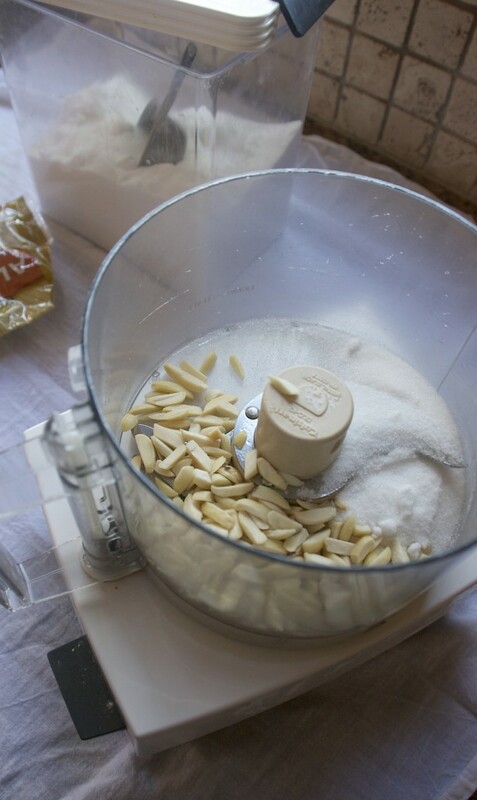 Place the almonds in the bowl of a food processor fitted with a metal blade and run until reduced to a fine powder. 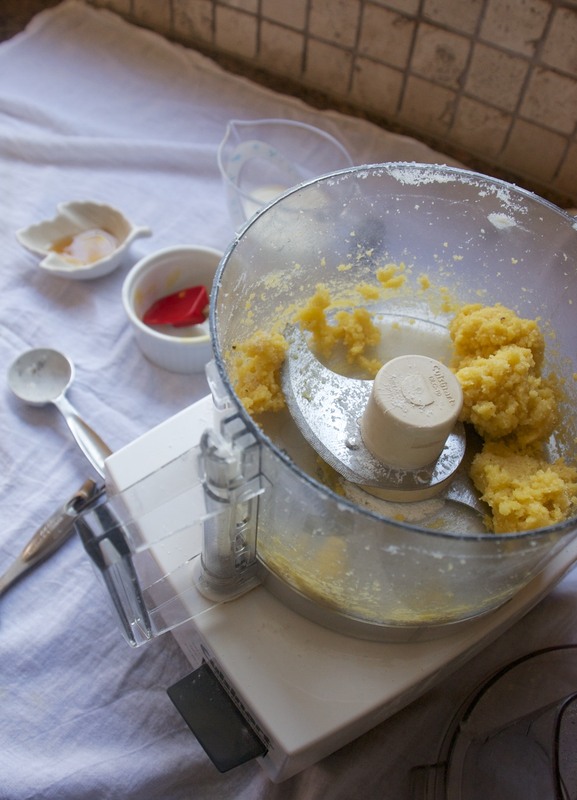 Add the flour and yolks, then process until the mixture is paste-like. Pour the milk in and process until mixed well. Add the flavorings and mix well. Set aside. 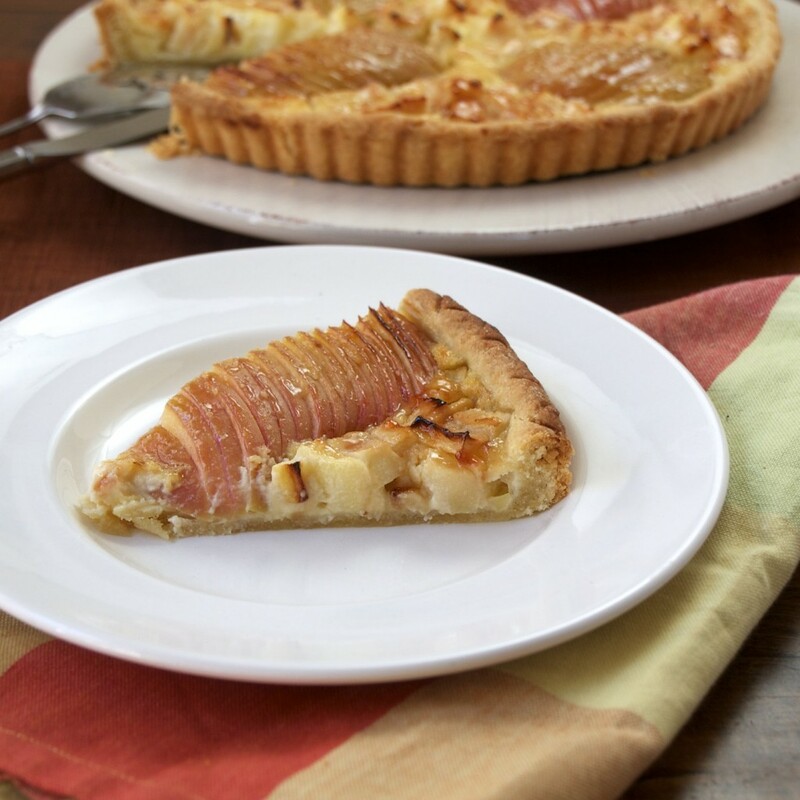 Lightly butter a 10-inch fluted tart pan with a removable bottom. 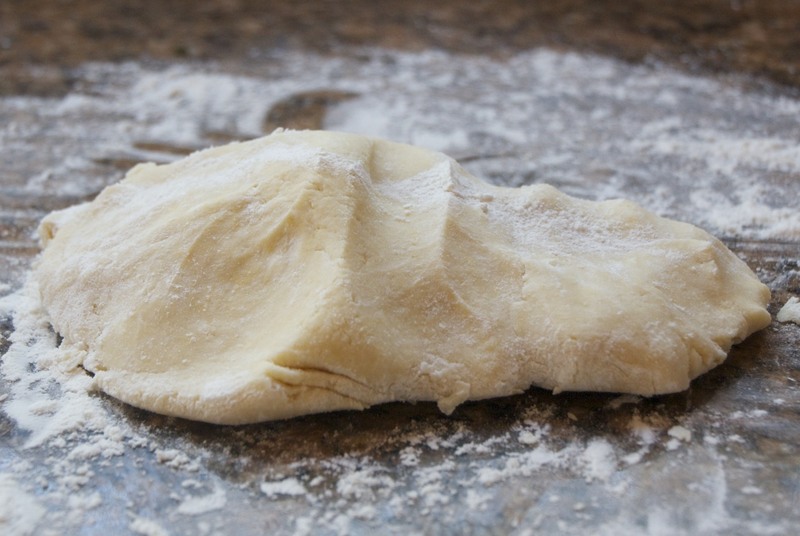 Remove the pastry from the fridge. 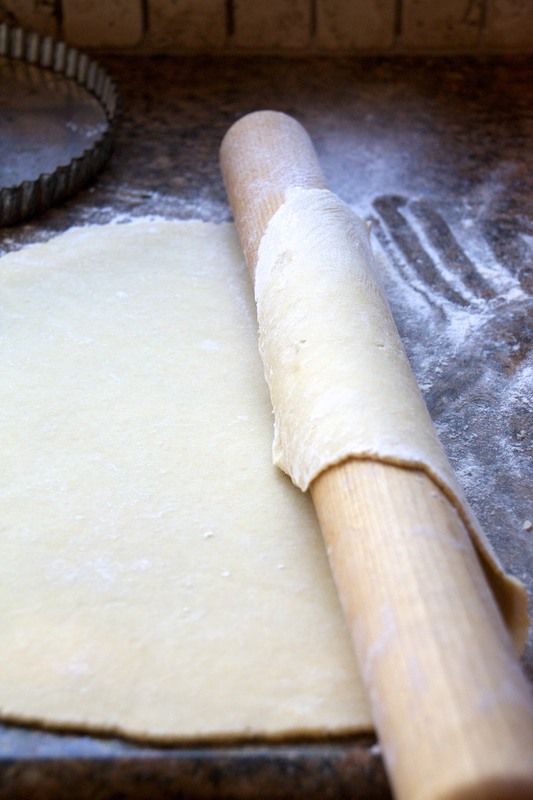 On a lightly floured surface, roll it into a round disk about 1/4″ in thickness and 14 inches in diameter. 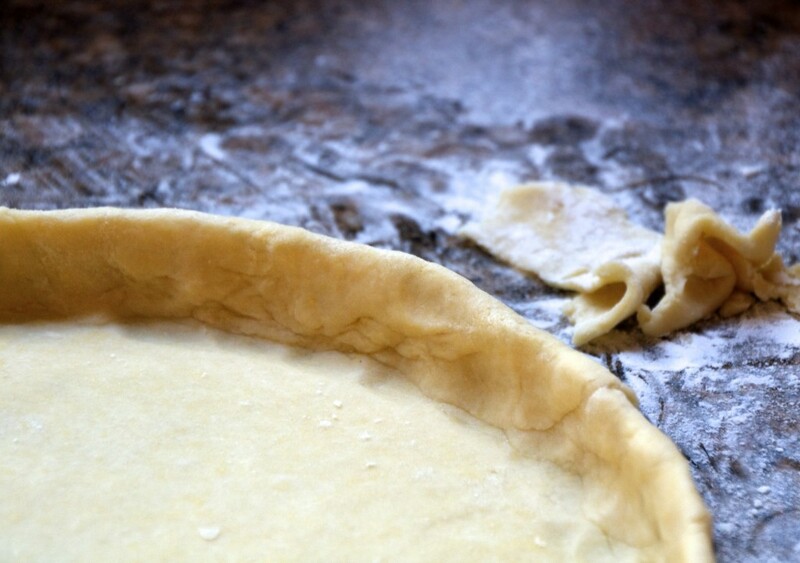 Place it over the tart pan and remove the excess dough. Gently press the dough against the sides of the pan and lightly prick the bottom with a fork. Chill. Peel the apples. Position each apple with stems pointing upward. 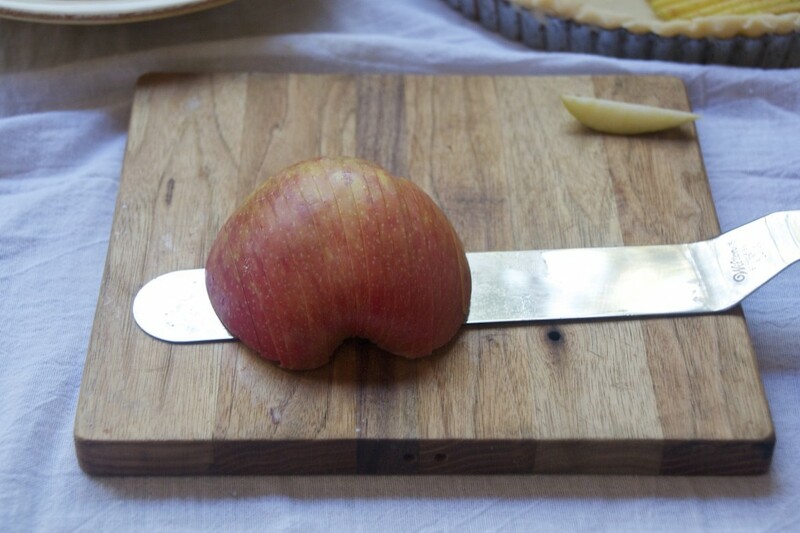 Cut down through the apple on opposite sides, running parallel with the core. Do the same for the remaining two sides. Your apples will be quartered and cored. 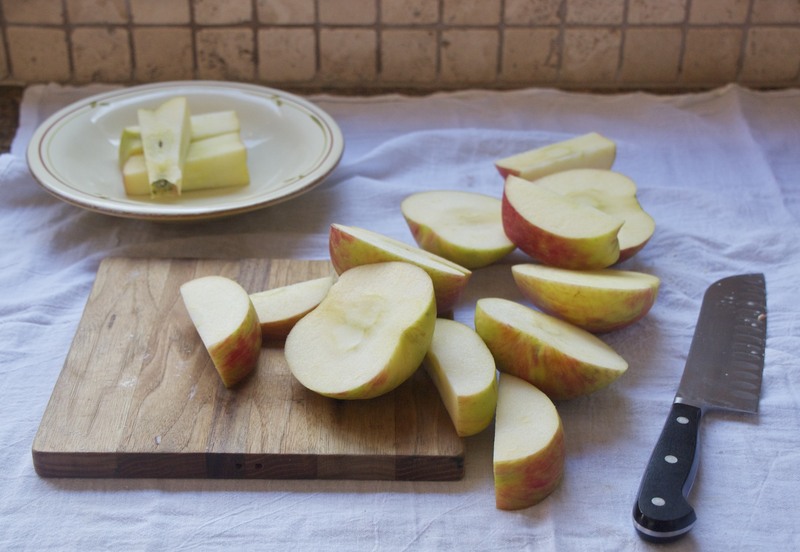 Place each apple quarter cut side down and make thin slices across the width of each piece. Slide an offset spatula beneath each quarter and gently press down with your hand to slightly “fan” the pieces, being careful to hold the general shape of the apple quarter. 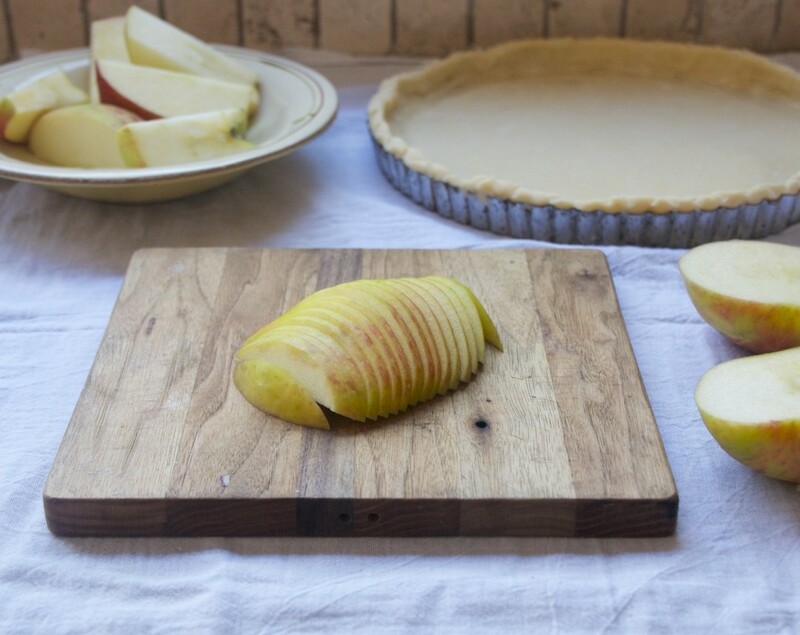 Arrange in the chilled tart shell. 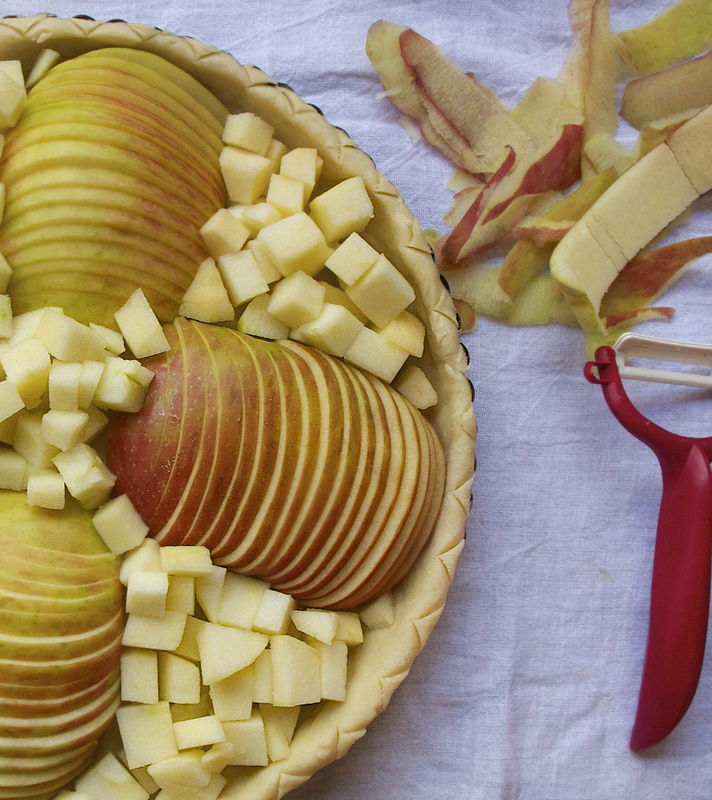 Once the sliced quarters have filled the ring and center of the tart shell, dice the remaining apples to fill in between the sliced quarters. Pour the custard mixture evenly over the apples. 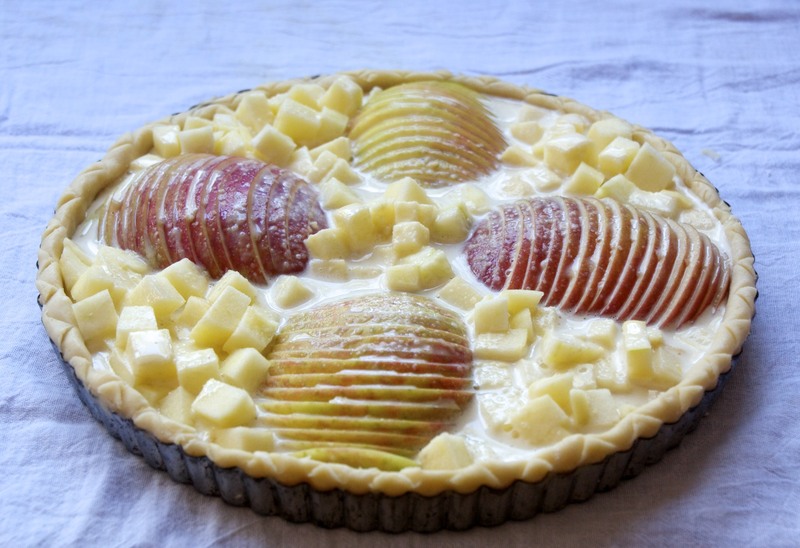 Place the tart on a baking pan and slide it into the oven. Bake for 10 minutes, then reduce the heat to 425 degrees F and continue baking until the crust and apples are golden brown, about 15-20 minutes. Remove from the oven and immediately remove from the tart pan. 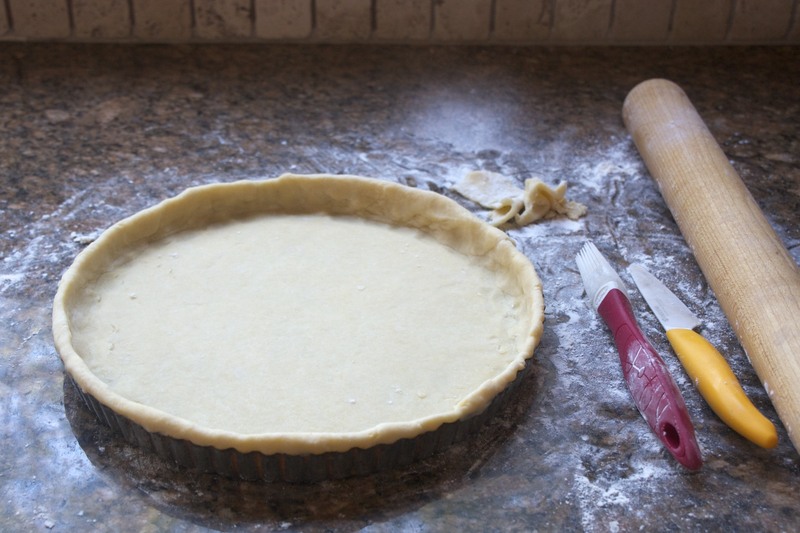 After removing the ring, run an offset spatula beneath the tart to remove it from the metal bottom before allowing it to cool on a baking rack. Heat the apricot jam and using a pastry brush, gently coat the top of the tart as it cools. Once cool, remove to a serving platter. Having always been a lover of French cooking, I recently purchased French Classics Made Easy by Richard Grausman, thinking it would be nice to learn some new tips for making some of my favorite recipes less fussy. 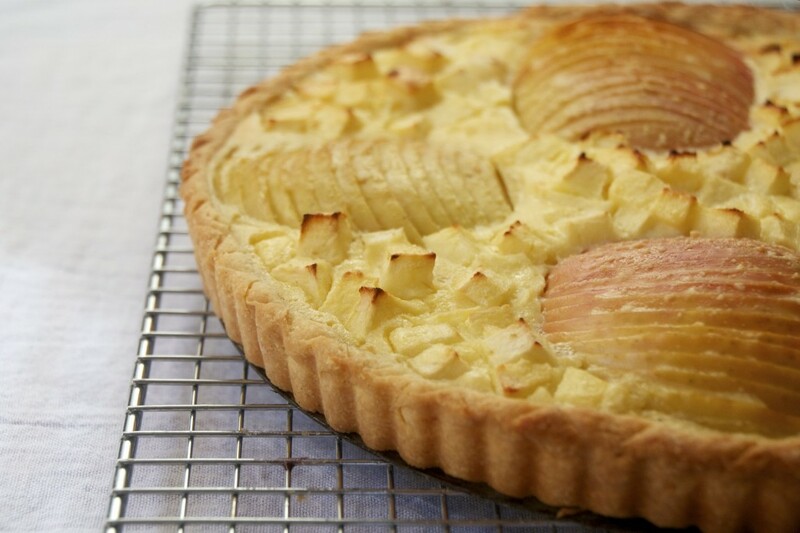 I tried this tart recipe first because I’ve always wanted to learn how to structure one in this Alsatian style, which can be used for any fruit such as pears, apricots, or plums. It’s pretty easy as long as you have an offset spatula. What isn’t necessarily easy about making this tart is getting it completely out of the tart pan when it’s hot from the oven. Not only is the ring hot — if the bottom of the crust isn’t done, then getting it off the metal bottom to cool on a rack is a challenge. Mine wasn’t completely done, so I put it back in the oven (it was turned off, but still very hot) without the baking pan beneath it for about 5 minutes. I was able to remove the bottom then. I guess my worries about a tart pan sitting directly over the heat on the bottom rack of a 500 degree F oven even for 10 minutes should have been ignored. If I’d decided to put the tart in there without the baking pan from the start, I probably would have been able to remove the tart from the metal bottom easily. 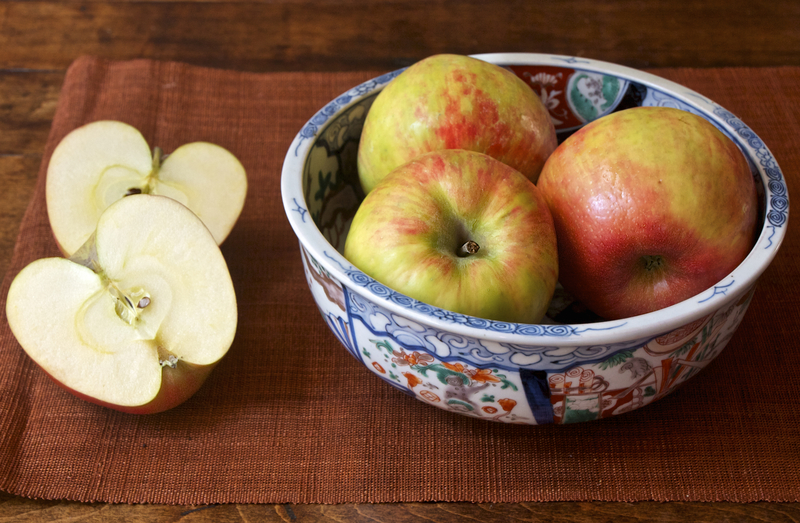 If Honeycrisp apples aren’t available, try any apple that holds up well in the oven — Pippin, Granny Smith, Jonathan, Jonagold, Braeburn, Winesap, Gala, and many more. Check your regional resources for what’s most available and when. So what about the diet? Well, traditionally, this type of tart is make with a very rich custard, but this one is pretty much made of fruit. The crust is very thin — you know where I’m going with this. Moderation! Enjoy a small piece and share the rest. 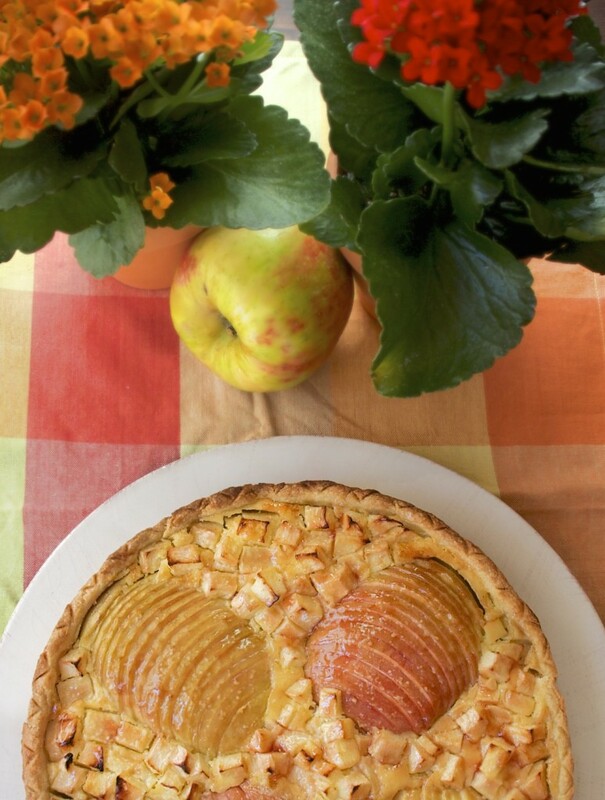 And, I made this tart early last October, so it wasn’t a current temptation, but biting into it is all about the apple. Nothing overly sweet, and definitely without any kind of eggy custard flavor that I know many don’t always like. It’s a pleasant recipe easily made with whatever fruit you have available. I need another cookbook like I need another leg, but I’m glad I decided to get this one.